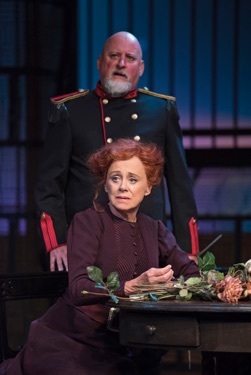 It is good to see that the Shaw Festival has finally got around to staging a major play by August Strindberg. While the Festival has been expanding its mandate so far that it has become increasingly vague, it has still not fully explored works in its original mandate of presenting plays by Shaw and his contemporaries. The Festival has staged no play by Strindberg since 1987 and has never staged such important works as Miss Julie (1889), The Father (1890) or A Dream Play (1907). 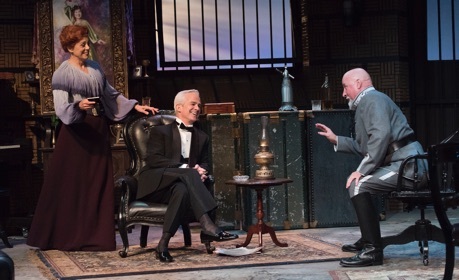 Luckily, the Festival is now presenting his influential pitch black comedy from 1900, The Dance of Death that is so uncannily modern in its themes and attitude you could easily mistake it for a contemporary play. Strindberg was not only a founder of Naturalism in drama but also of Symbolism and Expressionism. The Dance of Death is so unusual that it can easily be seen as a forerunner of Absurdism with Sartre, Beckett and Albee as later playwrights who show its influence. The play is set in the lodgings of Edgar, a Captain in the Coast Artillery, located inside the round tower of an island fortress. The tower was once used as a jail and place of execution. The windows are barred and a sentry passes by regularly suggesting that Edgar’s abode with his wife Alice is not so much a home as a prison. The couple is coming up its 25th wedding anniversary and they debate whether to celebrate it or not since they both agree their life together has been a living hell. Edgar’s outspokenness (though Alice would say his rudeness) has alienated all of their friends, their two children who refuse to speak to them and all of Edgar’s superior officers. They thus live in isolation tormenting each other and, yet, in their own perverse way, getting along. Edgar is lamenting the onset of old age and sickness, while Alice looks forward to Edgar’s death and her freedom. One mystery of the play is why the two have not separated. The surprising answer the action provides is that the two combatants actually suit each other perfectly. Weighed down with boredom they bring up and shoot down old arguments until something happens to change their habits. Alice’s cousin, Karl, comes to visit. He has been appointed to the Captain’s base to set up a quarantine station. It happens that Karl was the one who brought Edgar and Alice together for which he receives mostly blame from them. Though they have nothing to feed him and he doesn’t drink, the couple insists he stay with them. While the couple’s constant quarrelling puts him off, Karl stays both because Edgar clearly is ill and needs help and because Alice leads Karl to believe she fears for her safety. Gradually the power dynamics of the play shift as we see that both Edgar and Alice are toying with Karl. The scenario Edgar and Alice play out is that Edgar is set upon ruining Karl’s reputation to bring him down to his own level. Alice needs Karl’s protection so she can have Edgar arrested for a past fraud he committed. She also sets out to seduce Karl to replace Edgar once she is free of him. While it revivifies both Edgar and Alice, being torn between husband and wife causes Karl extreme distress. The humour and horror of the play is that causing Karl distress seems to be exactly the point of the game they are playing with him. Before Karl’s arrival Edgar and Alice each suggests that the other bring someone to stay with them. As Edgar remarks, “It was interesting in the way of an experiment, for as soon as a stranger entered the house, we became quite happy to begin with”. The problem they note concerning “the last time” was the “repercussions”. The addition of a third person gives the couple relief from mentally torturing each other. Instead they both get to torture someone else. In so doing Edgar and Alice each work out their wildest fantasies about their relationship and get them out of their systems for a short time by heaping them on a scapegoat. Those who thought Edward Albee’s Who’s Afraid of Virginia Woolf? (1962) was so revolutionary in depicting the viciousness of married life simply did not know their Strindberg and, in particular, this play. Those who thought Albee’s depiction of social interaction as game-playing was new also were ignorant that Strindberg had depicted exactly that idea in all of his domestic dramas from Miss Julie onwards. The particular structure that Albee picks up from Strindberg is a couple’s scapegoating an outsider (or outsiders) to purge themselves periodically of their own sins against each other. The theme of game-playing along with the depiction of the poisonous atmosphere of a bad marriage and of everyday conversations repeated into absurdity makes The Dance of Death feel more modern and incisive than many contemporary plays. anyone is superior to him. Edgar both denies and affirms that he is sick, yet what Mezon makes clear is that Edgar the soldier is paralyzed with the fear of dying. Edgar is thus both obnoxious and pitiable at once and Mezon so plays the role that our view of the character changes almost minute by minute. Reid makes a marvellous Alice. She makes Alice’s dry sarcasm appear funny, cruel and defensive all at once. If Edgar has an inflated view of himself as a soldier, so does Alice of her herself as an actress. Though neither Edgar nor Karl claim that Alice was a fine actor on the stage, Reid shows that Alice has channelled theatricality into her everyday life. Even before Karl enters the room, Reid’s Alice has posed herself decorously by her portrait. Her seduction of Karl, a former lover, is carefully planned step by step to make this newly religious man feel the greatest humiliation. 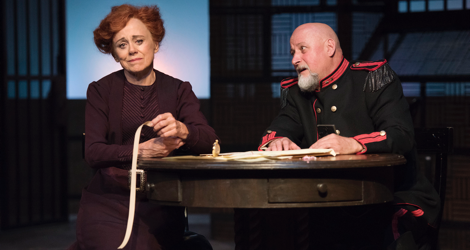 In some ways the Edgar and Alice of Mezon and Reid play out like an aged version of Shakespeare’s Benedick and Beatrice, who are only able to express their care for each other in the form of insults. At first Karl is like a representative of the audience on stage since he has to get his bearings in the midst of the bizarre relationship of Edgar and Alice as much as we do. Soon enough, however, we see flaws and weaknesses beneath his superficial innocence. After a divorce from his wife and loss of custody of his children, Karl fled to the United States for sixteen years and has returned newly religious. These facts gives Edgar and Alice enough ammunition to mount their attacks on him. The great virtue of Galligan’s performance is that he can play Karl as so righteous, virtuous and innocent that the character is unaware of his own flaws. Karl is a character who is in a near constant state of astonishment, but Galligan knows how to gradate his depiction until it finally rises into revulsion near the conclusion. Director Martha Henry keeps the tension high throughout the action. The rationale for two decisions in Act 2, however, are unclear. Sue LePage’s tower set has looked like solid stone all through Act 1. In Act 2, the huge blocks of stone making up the wall surrounding the large central double doors have mysteriously become transparent. Does this mean that the play has moved into a realm of unreality in Act 2? It so, it doesn’t make sense because Act 2 is where we discover there is a strong, fundamental basis on which the marriage between Edgar and Alice is founded. Also, if unreality is mean to be signified, why not make the all the walls, not just one section, become transparent. In her “Director’s Note”, Henry says she likes the versions of the play that do not bring the Captain’s servants on stage. She should extend that ban to the sentry who pointlessly walks past the windows and central door to the room. In his production in London in 2003, Sean Mathias dispensed with the sentry which had the advantage of making Edgar and Alice appear even more isolated and bereft of outward aid. Henry, however, goes further and in Act 2 the formerly youthful sentry now is in full-dress uniform with a beard and a limp. Does she mean that the couple’s night with Karl goes on for an eternity? If so, that is a mistake since the text makes clear that the couple indulge in periodically terrorizing guests on a regular basis. To see The Dance of Death in such a well acted production is an enormous pleasure that helps provide some perspective on when modernity in modern drama actually began. To see the finely tuned interactions of Mezon, Reid and Galligan on stage is a delight in itself that no lover of great theatre should miss. One can only hope that the success of this production will lead to a greater exploration of Strindberg to follow. Photo: (from top) Fiona Reid as Alice and Jim Mezon as Edgar; Fiona Reid as Alice, Patrick Galligan as Karl and Jim Mezon as Edgar; Jim Mezon as Edgar and Fiona Reid as Alice. ©2016 David Cooper.